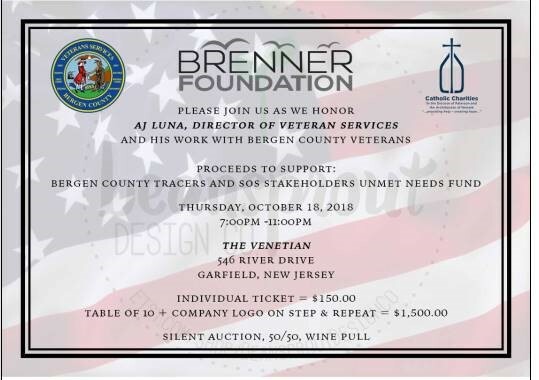 Brenner Foundation will be holding its inaugural Veteran Services Gala at The Venetian in Garfield, NJ on Thursday, October 18th. Proceeds from the Veteran Services Gala will support a partnership with two powerhouse organizations that are well known in the community for their work with veterans. The Bergen County Division of Veteran Services and the Catholic Charities SOS Stakeholders Group will work in association with Brenner Foundation to install diaper banks in New Jersey, which will provide access to clean, dry diapers to struggling veteran families in need. The event is for a very good cause that will fill a much needed gap in service for our veteran families. The honoree at the Gala this year is Ariel “AJ” Luna who is an Army veteran and the Director of Veteran Services for Bergen County. Part of the fund raising event by Brenner Foundation will go to the Veterans Unmet Needs Fund, Bergen County Tracers and purchasing diapers.